I can recall seeing a photograph of the As The Petals face powder box (manufactured by the Lazell Company) in Laura M. Mueller’s book “Collectors Encyclopedia of Compacts, Carryalls, and Face Powder Boxes”. I thought it was one of the most beautiful boxes I’d ever seen – and I hoped that someday I’d add one to my collection. When the box finally popped up for bids on eBay I was determined to win it, and I did. At that time (several years ago), it was the most expensive face powder box I’d ever purchased (it was a little over $100). It dates from the 1910s, is in remarkable condition, and I’ve never regretted buying it. The design on the box has always reminded me of the dancer Isadora Duncan, considered to be the mother of modern dance. Just as the woman on the powder box, Duncan had a fondness for long flowing scarves (more on this later) and she danced in her bare feet. I wouldn’t be surprised to learn that Isadora was the inspiration for the design on the box. The dancer was born in San Francisco in 1877. Her family moved to London in 1899, and it was there in the British Museum that she and her brother Raymond immersed themselves in every aspect of the culture of ancient Greece. By 1910 Isadora had borne two children – Deirdre (with theater designer Gordon Craig) and Patrick (with Paris Singer, one of the heirs to the Singer sewing machine fortune). On April 19, 1913 the children, accompanied by their Scottish nanny, were being driven from Isadora’s townhome in Neuilly-sur-Seine to the Trianon Palace Hotel in Versailles. The car stalled after narrowly avoiding a collosion with another auto. The chauffeur got out to crank the machine back to life, but he’d neglected to set the hand brake. The car rolled across the Boulevard Bourdon and plunged into the Seine, where tragically the children and their nanny perished. Isadora was devastated by the loss and fled to Corfu to spend time with her brother and sister. It wasn’t long after her trip to Corfu that she traveled to Viareggio with the actress Eleonora Duse. Duse had been involved in a lesbian relationship with Italian feminist Lina Poletti, and so the rumor mill ground out stories about the nature of the friendship between the two women. Because some of the correspondence between them has survived, it appears that the rumors were true. Isadora was a free spirit who refused to accept the status quo for women. In her quest for a life unfettered by conventional expectations she was drawn to post revolutionary Russia, and moved to Moscow in 1922. Conditions in the new Soviet Socialist Republic were bleak, and when the government failed to make good on their promises to her she returned to the West after only two years. During her time in Moscow Isadora had become a Soviet citizen due to her marriage to the poet Sergei Yessenin – who was 18 years her junior. Isadora spoke few words of Russian, and Sergei spoke no foreign languages, so it must have been chemistry that drew the two together. Yessenin was a talented and popular poet, but he was addicted to alcohol and when he was intoxicated he was inclined to rages that frequently ended in violence. It was no surprise to anyone when Sergei left Isadora and returned to Moscow. Sadly, he soon suffered a mental collapse and was institutionalized. He was released in December of 1925 and attempted suicide by cutting his wrists (and writing a farewell note in his own blood!). When that attempt failed, he succeeded the next day in hanging himself from some heating pipes in a hotel room. Sergei was only 30. 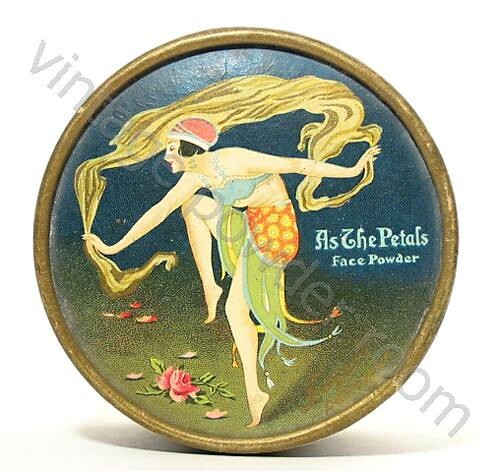 Earlier, I had mentioned that Isadora had a penchant for wearing long flowing scarves – in fact it was one of the reasons that the As The Petals face powder box reminded me so much of her. On September 14, 1927, Isadora wrapped a long hand painted silk scarf around her neck and got into a car with Italian mechanic, Benoît Falchetto. As the car pulled away Isadora waved to a group of friends, reportedly saying “Adieu, mes amis, Je vais à la gloire!” (“Goodbye, my friends, I am off to glory!”). The scarf fluttered dramatically behind her, but as the car picked up speed it became entangled in the spokes of one of the wheels and tightened around Isadora’s neck. The dancer was yanked out of her seat and over the rear of the car, and then dragged along the cobblestone street to her death. In the years following her demise, the quote attributed to Isadora was revealed to have been false. Because Isadora had been driving off with a handsome (and much younger) mechanic, the friend who had supplied the quote thought that the truth would be embarrassing. Isadora’s actual last words were “Je vais à l’amour” (“I am off to love”). Isadora was a rebel, and so she appealed to the so-called second wave of feminists during the 1960s. 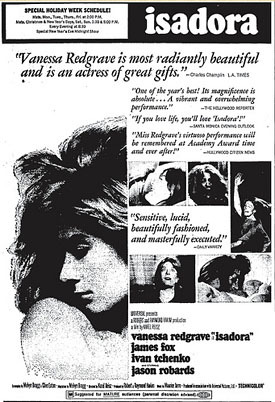 For an interesting take on Isadora Duncan see the 1968 film, “Isadora” starring Vanessa Redgrave [You may need an old machine — I believe that the film is available only on VHS]. 12:42 pm, 26 June, 2012 р.